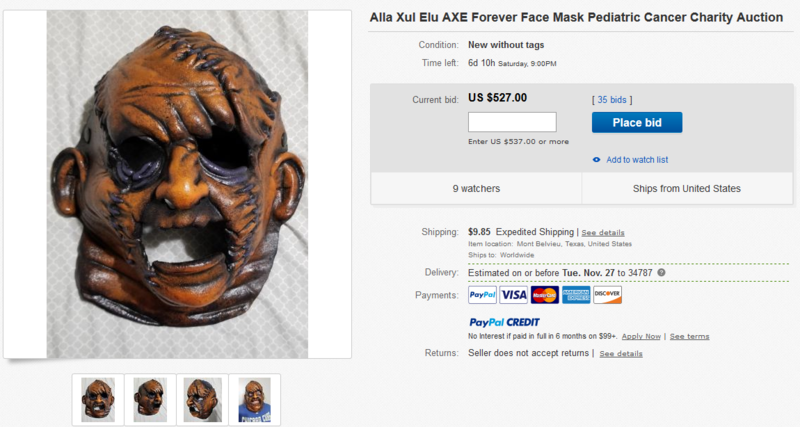 Tom Martino, the Mask Masker behind Alla Xul Elu’s signature “Forever Face” has put together an auction for an exclusive one-of-a-kind Forever Face and its goal is to battle the cost of Pediatric Cancer. No other masks have been painted like this! Tom Martino formed his mask company DWN Productions in September of 2005 after Mr. Martino graduated from the Tom Savini school in Monessen, PA. All profits from this one-of-a-kind Forever Face mask auction will go to help Tom Marino’s great friend, who’s 2 year old daughter Emma is sadly fighting a form of Pediatric Cancer known as “Neuroblastoma”. Here is a blurb from the GoFundMe page. So far the auction has 35 bids and the one-of-a-kind Forever Face mask auction has hit a total of $527.00 with 6 days left to bid. Shout out to Alla Xul Elu for spreading the word and let’s help Emma, ninjas!